Some time before the release of CP2017 I published a blog post, where I explained how I use the GIFT import for localising projects. Time to check if a similar solution is possible with the new CSV import. I used the provided template file, an Excel spreadsheet with macros. ‘CSVQuestionsCreationMacro.xlsm’. You find this worksheet in the GalleryQuiz. That may be a problem for users who don’t have administrator rights, because the installation folder is not always accessible for them. That is one of the reasons that a lot of folders are duplicated in the Public documents (Windows) or Shared documents. You can watch this movie, which I’ll also be using to explain the Branch aware functionality in a future post. After the title slide, you have a choice slide: you can opt to take the quiz in one of three languages. Or, if you are trilingual, why not choose the option ‘ALL’? I used the provided Excel worksheet to create these questions. I first double checked the Quiz Preferences for the Default labels, and the master slides. I took out the option to show the Progress. Reason: contrary to all other labels, when you change the Preferences to have another language, the labeling of the Progress will not remain on the existing slides. That is an annoying small bug. The progress text will always be converted to the last used language. For the MCQ slide with multiple correct answers, you need to set up the individual scores manually for each of the answers. 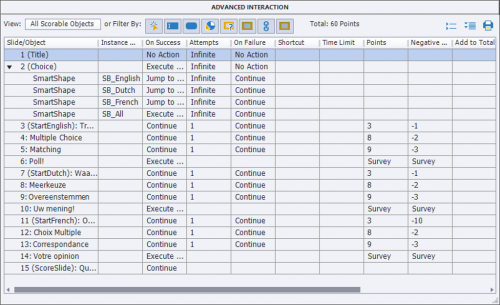 With GIFT import it is possible to insert already the positive partial scores, not with CSV for what I detected. It is very easy to set up the Matching slides, the Help documentation is not updated: you do not have to insert the pipe sympbol, there is a matching field. Nicely done! The third sheet of the Excel worksheet has the fields for the to be exported CSV file. However you are not allowed to edit those fields. You don’t have access to the questions as they were defined in the second sheet, so that is not a workaround. My workflow was to use the exported CSV file with the English questions, and open it in Excel as a copy. That file can be translated to any language. You can save it as a CSV file from Excel and import in Captivate. Before importing such a translated file, I set the Quiz Preferences to the correct language. Especially the Default labels need to be translated. For that purpose I have always a Preferences file ready that can be imported. Only newly created quiz slides will take on those new labels (also for the buttons), with the exception of the Progress mentioned above: it will also override the progress on existing quiz slides. At this moment, I still have a slight preference to use GIFT files for import, especially if I need to translate questions for the same project or for other projects. Translating a GIFT file, that is already set up correctly is a quicker workflow. Being able to define partial score in that file is another plus. In a next blog post, I will explain the ins and outs, and the setup of the Branch aware feature which has been used in the example file. The post CSV import – localisation appeared first on eLearning. I hope this blog provides practical pointers that you can use to successfully localize your eLearning courses. The post Localization in eLearning-Tips and Best Practices appeared first on eLearning. This article will not be interesting for you if you always create courses in the same language, and you have Captivate in that same language. In my casen Captivate is not released in a Dutch versoin, and moreover I sometimes also need to create French courses, along with English courses. Practical tips to save time when localising are always welcoem. Today i will focus on Quizzes. I have an English version of Captivate but want to create a quiz in Ducht and in French. What is the work flow? Start by localising Default Labels in the Quiz Preferences. 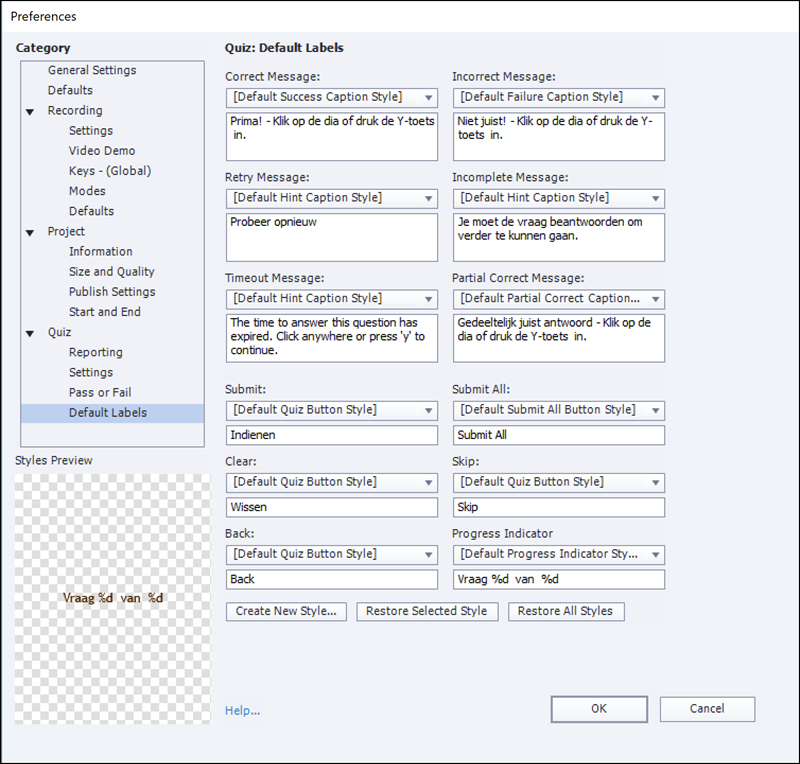 That dialog box allows you to translate messages and labels on buttons. You don’t have to translate labels that you’ll never use. As you can see in this screenshot, I never use Skip/Back, Submit All nor the Timing message. After savibg the Preferences, usie File, Export, Preferences. You can import them later on in any project where you need the same language for a Quiz. Welke componenten maken deel uit van een thema? Watch how the Question title placeholder now has a Dutch text. The feedback messages are translated as are the labels on the used buttons: ‘Submit’ became ‘Indienen’ en ‘Clear’ is now labeled ‘Wissen’. The tiny progress indicator is translated as well. You may have to check the score, because the partial scoring will have rounded numbers. In this case it is not necessary: 3 points go to the second and fifth answer, 4 points to the third answer. You will have to contact me if you want to try out the GIFT. Impossible to upload it, and links are not allowed. The post GIFT and Localisation appeared first on eLearning.